Why is this early auto pioneer's body being exhumed? Samuel Pandolfo had dreams of competing with Henry Ford. His dream nearly came true. Now, 51 years after his death, his body's being exhumed from its grave in Alaska and shipped to St. Cloud, Minnesota — home of the largest automobile factory you've never heard of. A former insurance salesman, Pandolfo launched a grand plan to build a global auto maker in St. Cloud in 1917, eventually selling over $9.5 million in stock (about $160 million in current dollars) to start the Pan Motor Company and finance the construction of a 22-acre auto plant, including one of the largest drop-forge foundries in the country. The factory turned out 737 copies of the Pan Model A — a car built to traverse the back woods roads of the day with a built-in ice box, tool chest, and seats that folded down flat for roadside accommodations. Pandolfo was a consummate promoter who sold shares to small investors, built houses for his workers and held huge picnics for the city. But that salesmanship and allegedly false claims related to stock sales led to Pandolfo's indictment for mail fraud and conviction in a Chicago court, followed by time in Leavenworth Federal Penitentiary. 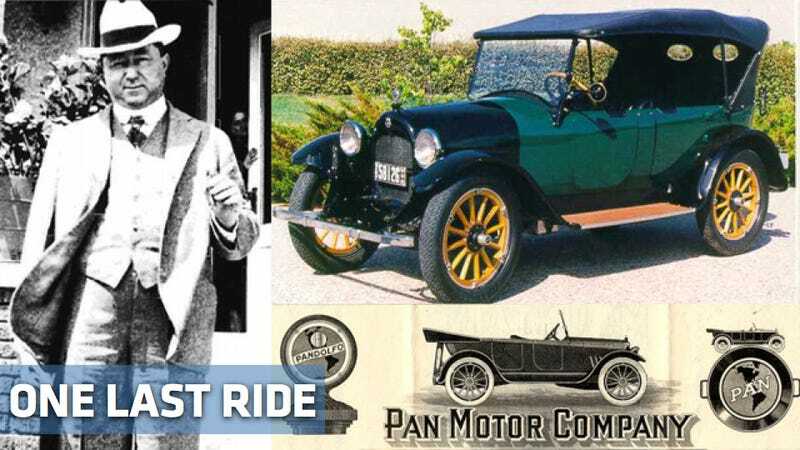 Backers contend Pandolfo was railroaded, but Pan Motor Company folded in 1923 due to lack of funds and bad publicity from the conviction, with Pandolfo serving two and a half years of his three-year sentence. After his release he returned to St. Cloud to a welcome from 600 well-wishers and a brass band vowing that even as he was moving on to Virginia and eventually the far North that "when I die I desire to be buried here. I want my dust to mingle with yours." Pandolfo died of a stroke at age 85 in 1960 in Alaska, after time spent prospecting for oil. Buried in a wooden casket with a temporary marker in the Birch Hill Cemetery in Fairbanks, a St. Cloud car club sent two different gravestones to mark his resting place while working to have his remains returned to Minnesota. After hearing of their concern his great-grandson contacted the club and eventually worked with the cemetery in Fairbanks to have his body exhumed, cremated and returned to St. Cloud. Pandolfo's expected to return in August. No word on whether a brass band has been arranged. This story was submitted by Charles Hamilton, an avid Jalopnik reader; if you have a story to share, email us here.